Fur loss or hair loss in pets can be an indication of parasites or of any number of other general health conditions in your dog, cat, or other pet. Beyond impairing your pet’s appearance, it can also indicate nutritional deficiencies or overall immune deficiencies that can lead to more serious health problems, so fur loss should be taken seriously. The first place to look for the cause of your pet’s hair loss or fur loss is with regards to any change in its diet or environment. New food may improve a fur loss condition. Addition of apple cider vinegar (ACV) to food or water may help, as may a diluted ACV spray for its coat. Continue reading to learn which remedies our readers have tried to regrow fur in their cat or dog and whether they were successful. On August 13th I posted a photo of one bald patch. After using ACV and coconut oil topically, and feeding raw honey, organic Greek yogurt, ACV and coconut oil for approx. 10 days the hair was growing back in. The photo enclosed in this post was just taken today. Seven days ago she had another break out, but this time more hair loss/more balding spots. There is no redness. They come in a little lumpy and the hair falls out. She has been licking her paws a lot but she has no irritation on her paws or anywhere else on her body. Started back with the above regimen five days ago, it is looking better, and the hair loss has subsided. Initially, after the first break out I thought she may have put her head into a bush that may have had chemicals on it. She is fed raw food and is 2.5 years old – we haven't had any allergy issues but she has been sneezing on and off these last five days and have given her Benedryl the last three days. Eliminated some new grain free chicken treats as I figured out she gets a little rash in her armpits from them. Thanks in advance for our time! Hopefully this will help someone else too. I had a frenchie that looked like this, and there were bumps that would come loose with the hair and then the bare patches; I was told it was a staph infection and it was treated as such. That was many years ago, and now looking back I suspect my main problem was a systemic yeast infection. I suspect your dog does have allergies OR a doggy leaky gut [systemic yeast] that is creating sensitivities. Despite the excellent chow you are feeding, if you do not correct the imbalance in the GI tract this will persist. You might consider Ted's Borax protocol for dogs to combat the yeast in the gut from the inside out, and also check out alkalizing the water for these types of break outs also. I thought this was going to be for humans, but then the article started talking about paws! I have a Brittany Spaniel dog who is two and a half years old. For a year he has been getting the same allergy i.e. loses his fur around the corner of his eyes and itches. The vet has prescribed steroids several time. The allergy goes but comes back 3 weeks after the treatment is stopped. I hate giving all these pills to my dog. Currently I am giving my dog Science Plan food. I'm desperate to find a remedy which is natural and healthy without involving any medicine and pills and whatsoever. I have a cat that is pulling her hair out. My vet says it's because she's an older cat and does this instead of cleaning herself. I find it hard to believe as she runs around the house like a kitten. Does anyone have an idea what could be causeing this? Thank you for reading. My four year old yorkie lost all his hair in the back and legs, only has hair on his head and ears. Have seen two specialist vets: dermatologist, and internist and three other regular vets. Prescribed expensive shampoos, including one with lyme. My dog is so skinny its only the bones covered with a very dry black skin with scabs. Diagnosis ringworm ( never had ringworm symptoms ; ie reddish skin round scab – no never, his skin just got black, lost some of his nails, but all these vets insist it is ringworm. Have been given antibiotics also. Very expensive powder for immune system. I have sprayed him with the apple cider vinegar, used aloe plants and coconut oil and one of my creams of ketoconazole. I am desperate, because he also doesn't like to eat. I would like to try the betadine, lamisil and tea tree oil. Where else can I go? I have spent lots of money in five vets, and my dog is worse. please help if you know a similar case. Mallki from Miami. Re your poor dog. Three suggestions. Obtain affordable MMS online from Jim Humble's Website or Real Raw Food in Canada online. Make 20 by 20 drops as per instructions for skin conditions and spray on to dry. He has to wear a cone for the time it takes to dry. This, two to three times a day. My dog is now free from mites after less than two weeks, done twice a day. 1. Diet – make sure your pet is on a good brand of pet food or a raw food diet. A “Good” brand includes something that has NO corn, wheat, soy, or animal by-products. To go a step further without going raw, try a good grain-free diet. 2. Thyroid problems – have a blood panel done to see if your pet’s thyroid is functioning properly. I have seen many bald dogs that are all suffering from an under-active Thyroid. After determining if this is the problem, refer to remedies for Thyroid. Please also check if hormone creams are being used by the owner. My 6 pound dog has had unexplained, frustrating and sad hairloss for two years. I homecook for him. And I have tried everything I can think of, including melatonin, which has shown no results either. I think it is the compounded estrogen cream I have been using, and recently veterinarians are seeing more and more of this cause. Save yourself a lot of money in lab tests which show no results. I will be stopping the estrogen use as of today. I am asking for help for an estrogen detox for my poor little guy. He is otherwise in great health, but he is young. His liver needs a detox, I think. Any suggestions??? 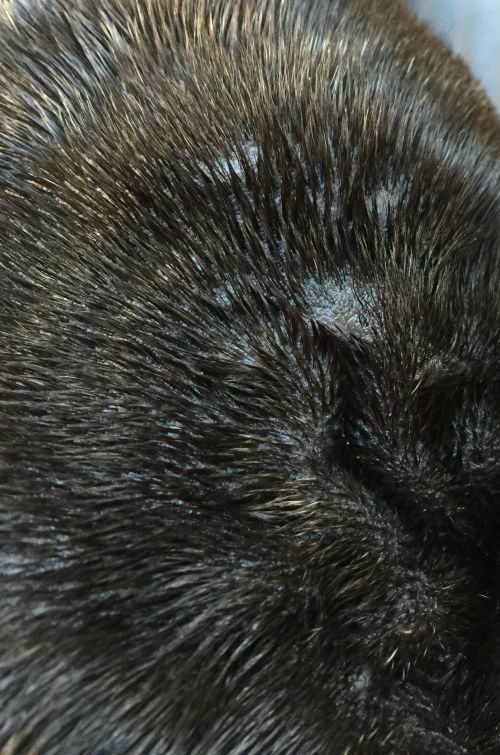 During an experiment using multiple methods to treat warts on a bald, blue dachshund (tendency of thyroid problems and alopecia is high with this color in the dachshund world) I had an unexpected outcome. My bald dog is growing hair on 100% of his little blue body!! I attribute this to the Atomidine (iodine) I was trying it on a couple of the warts. A friend had a bald dog and gave it Seameal (enzyme supplements)… Main ingredient was kelp. The dog went from completely bald to 100% hair growth. Common denominator here is iodine!